Wednesday 4th August, Madrid, Spain. The last few days have seen a few ups and downs in The Savage Files project. Most importantly, orders for my book "..Everywhere but Missouri, mate!" have been exteremely disappointing. For me, this really felt like a letdown. Last week, over five hundred people checked in on my website every single day. My latest newsletter- promoting the book- was sent out a week ago to over 1200 people. In spite of this, orders haven't even reached a third of what would be necessary for the publishing to be a viable proposal. That really knocked the wind out of my sails for a couple of days, since everything about the future of this project relies on the successful sale of this book. This trip will be over within a month or two if I can't go ahead with the book, but for now I'm putting that worry to the back of my mind and getting on with life. At the same time, I was also disappointed not to hear back from any of my potential hosts in Madrid. Not that I have anyone but myself to blame for that. I hadn't contacted them until the day before I arrived in the city. So welcome to Madrid... each morning I would check out of Los Amigos, hoping to hear from one of my hosts by email during the day. By evening, I would inevitably wind up back at the reception desk at the hostel, and shell out another sixteen Euros. It wasn't all bad though- I did make lots of friends at the hostel, and many a pleasant hour was spent sitting around the common room swapping travel stories. I even bumped into Ariel in the street one night. Remember Ariel, one of the gang from Essaouira? But at the end of the day, I didn't come to Spain to meet Aussies and Brits. 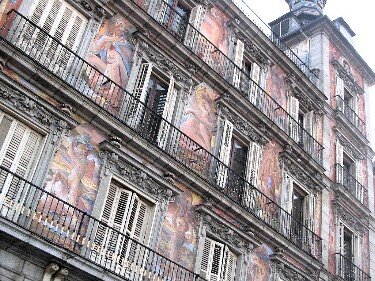 I wanted to meet Spanish people, and see how people live in this country. Then an email came through from Maria... "Sorry to not get your email earlier, but if you still need hostage in Madrid, phone me and you can stay at my place." Woo hoo! Thanks Los Amigos, but I'm outa here. 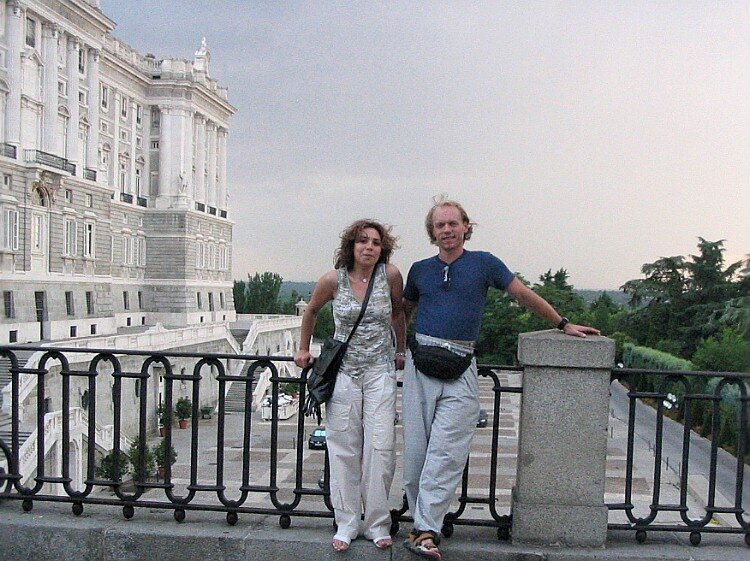 I phoned Maria and we met in nearby Plaza del Sol at four o'clock, after she'd finished work. Maria works for a telecommunications company, and during the summer only works from eight till three. I forgot to ask her why her summer schedule is so much lighter than the rest of the year, but I'm guessing it's because so many Madrid residents leave during the summer. 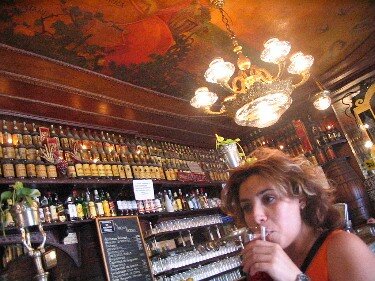 I've learnt quite a bit about Madrid (and Spain as a whole) in my couple of nights here at Maria's. Although the central tourist areas appear to be quite busy (for example the first backpackers hostel I tried was fully booked) it is another scene altogether in the suburbs. Hundreds of thousands of Madrid residents flee the city during the summer to escape the heat. In Maria's neighbourhood, many of the bars and shops are closed, signs on the door promising that they will reopen in September. I find it quite amusing that such a significant proportion of the population just 'jumps ship' every year when it starts to get hot, especially since the weather has been quite pleasant since I've been here. Hot, yes, but not worth running away from. 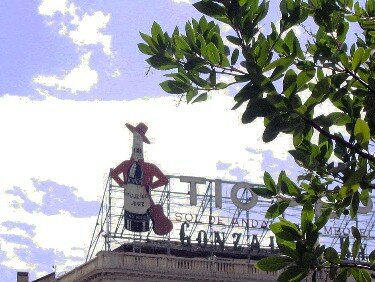 When I first arrived in Madrid, I checked what my Lonely Planet book had to say about the city. In the "Things to see and do" section, it went something like this... "this museum, that museum, another museum, and if that's not your cup of tea, there's always more museums." What? After reading that, I wondered if I'd even enjoy Madrid. The only non-museum alternative that the book gave me was the El Rastro flea markets. I made sure I caught the markets on Sunday, and they were quite impressive. I really wanted to find myself a new shirt, but couldn't see anything I liked, so bought a pair of shorts with zip pockets to foil the pickpockets. Since then I've spent my days wandering the streets and parks of the capital, stopping in for refreshment to various little backstreet bars and cafes. This city has some beautiful green spaces. 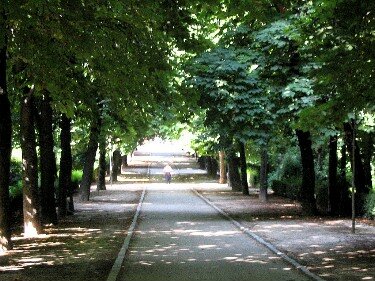 When I was waiting for Maria to finish work, I lay down on a park bench in the long, narrow park outside the famous Prado museum, and lulled by the cool, moist air, fell straight to sleep. *Did I go inside the Prado? What do you think? Not a chance. I spoke to a couple of backpackers who'd been inside, and they said it was just full of paintings and stuff* Yesterday, my walking tour of Madrid took me in an even wider circle, seeing me lost in the huge, sprawling Parque Del Retiro for hours. Maria has been showing me around town in the late afternoons and evenings. Being on her light summer schedule, she said she has plenty of free time, and she seems to enjoy walking as much as I do. On Monday evening, we met up with some of her colleagues for her workmate Julian's birthday. It was a beautiful evening, so we sat outside a cafe for a few hours, drinking cerveca con limon- beer with lemonade. Now, pouring lemonade into perfectly good beer isn't something I'd normally do, as you know, but I must admit it was very tasty and refreshing, and not as dehydrating as beer alone would have been in the hot weather. So there. Don't knock it till you've tried it. We moved on to a restaurant, where food just continued to be brought to us, more and more and more... chorizo sausage, fried chicken, dishes of potato with eggs and ham, and an interesting dish that was simply small cubes of fried pork and whole fried green peppers. Maria explained that this dish is always quite an adventure, since not all of the peppers are very hot, but now and then you'll find one that peels the skin off the roof of your mouth. Somewhere around one in the morning, we ended up in a small bar, drinking Mohitos, one of Maria's colleaugues commenting that it's not a bad way to start the working week! I had a great night, my cheeks were sore from laughing so much, and I especially appreciated everyone's patience as they deliberately spoke in English almost all night, so I could be included in the conversation. Yesterday Maria found a cinema that was playing Michael Moore's latest film in English, so we started our evening off with a six o'clock screening of Farenheit 9/11. Not a real cheerful way to start an evening, as it tunes out, but we had both been keen to see it. I'm not going to discuss the movie here, because I wouldn't know where to start or stop. From the cinema, we walked towards Latina, an area famous for its bars and cafes. Along the way, we stopped for a photo at the spectacular Royal Palace. A fresh gust of wind whipped up, and from nowhere the heavens opened, pounding us with fat, cold drops of rain. Maria and I made a dash for the small wine bar across the wet road, but we weren't the only ones who sought refuge there. Before long, the narrow bar was standing room only. We laughed and ordered a drink. The barman gave me an surprised look when I ordered a cafe con leche. I asked Maria if my pronunciation had been bad, but she said no, he was just surprised that I'd want coffee so late in the day. It was time for wine now, apparently. 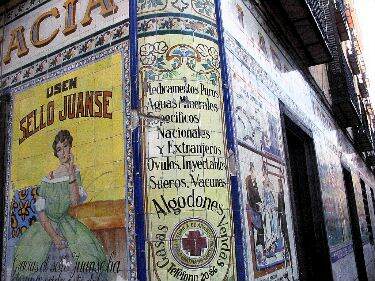 The rain soon passed and we made it to Latina and stopped into a small bar on a narrow cobbelstoned street. If it sounds like we walked for miles, that's not really the case. Central Madrid is quite compact, with most of the areas you'd want to visit all within a radius of less than a kilometre. We were both a bit peckish, so we ordered a couple of tostadas to go with our crisp, refreshing Tinto De Verada's. *If Mum is reading this, I'm sure to get an email telling me that I'm drinking too much* Maria let me choose the tostadas, since she said she likes everything on the menu. I chose one with avocado and caviar- first time I ever tried caviar!- and the other with a spread made from blue vein cheese and cider- strange but true! After a month in the mountains sleeping on the floor, living on sandwiches and drinking wine from a one litre carton, it felt great to be in civilization, drinking quality wine and nibbling on caviar and blue vein cheese. Thanks Maria, I almost feel like a human being again!